The Mr Gay World competition is, essentially, a global search for LGBTQ+ heroes. The Mr Gay World event is held annually by a different country, and attracts participants from across the globe. The week-long 2018 event was held in Knysna, South Africa, and The Social Media Company was employed as the official social media partner for the event. As part of our corporate social responsibility initiatives, The Social Media Company opted to provide all social media management services to The Mr Gay World Foundation on a pro bono basis. We took responsibility for Mr Gay World’s social media initiatives before and during the event, and continue to have a strong relationship with the organisation. During the intense competition week in Knysna, The Social Media Company team followed the delegates, representing 19 countries, on their journey, and documented it on social media. We also offered huge exposure opportunities to the corporate sponsors of the event, among these, Mango Airlines. 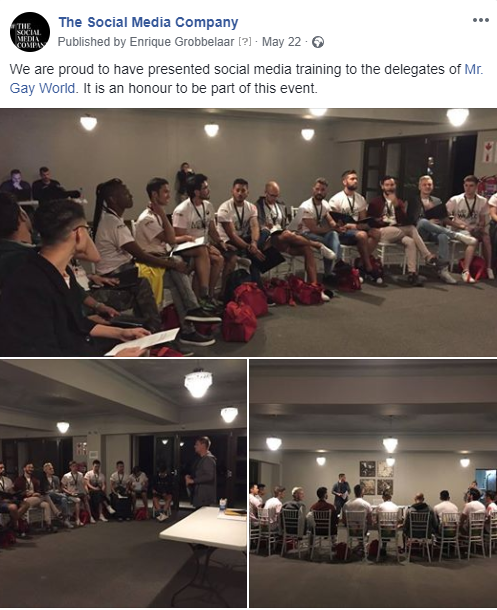 The Social Media Company was also asked to present social media training to the 2018 Mr Gay World delegates, and our team members were the official judges for the social media category of the competition. As the event coincided with the annual Pink Loerie Mardi Gras & Arts Festival in Knysna, The Social Media Company also managed the social media marketing for the 2018 festival. 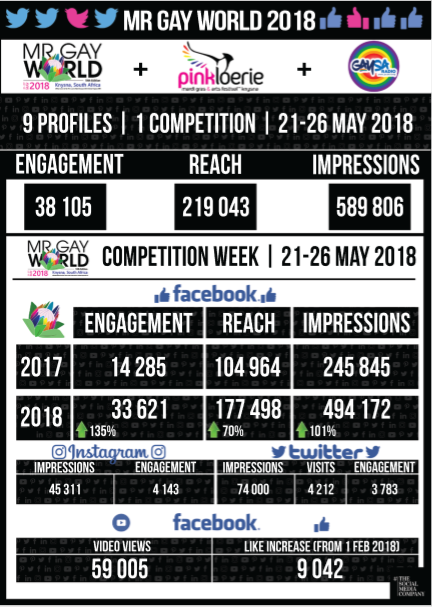 We managed to increase Mr Gay World’s social media engagement with 135%, compared to the previous competition. Impressions increased with 101%, and the brand’s reach was up by 70%. 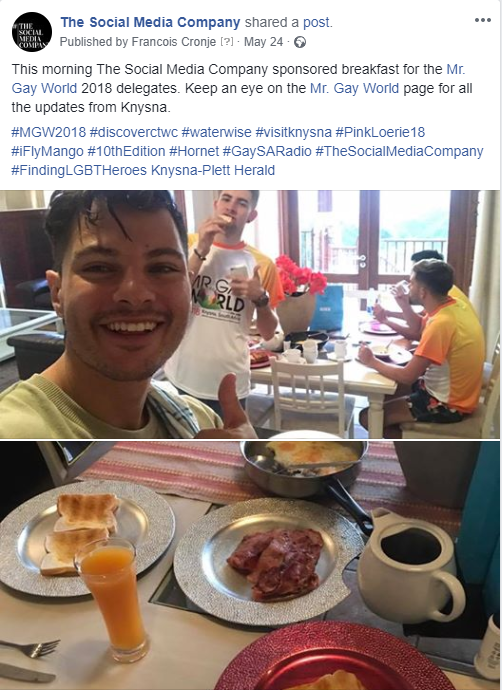 Before, during and after the 2018 Mr Gay World event, we wrote multiple blogs for Mr Gay World and the Pink Loerie Mardi Gras & Arts Festival. Our pieces on these events, hosted in South Africa, gained a lot of traction, with one particular article going viral across the web. 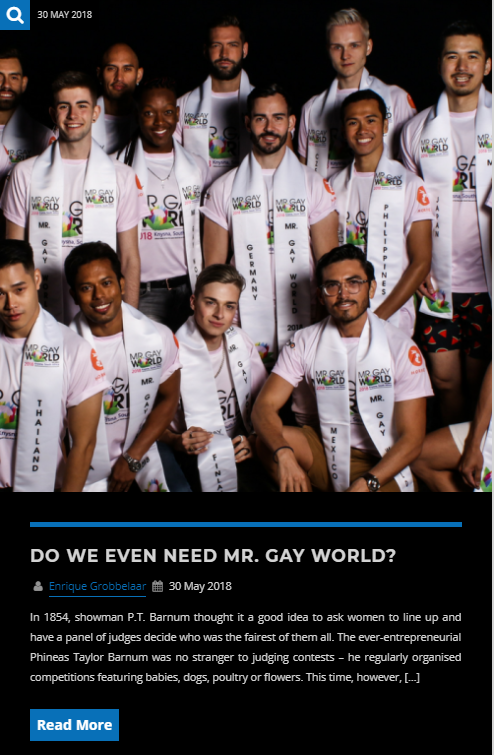 The article titled, “Do we even need a Mr Gay World?”, was first published on GaySARadio.co.za and remained their most read article for 2 months after publication. It still remains one of the most read blogs on the GaySA Radio website. The article was also republished by various other reputable online publications, including Gay Pages.